Here&apos;s how you can install the plugin above by referring to the sample tutorial here. Do take note that once this plugin is installed, purging cache can be done in a breeze. Login to your Joomla Administration dashboard and click on Extensions → Plugins. Type "Cache" on the search box. You shall see a list of cache plugins. Click once on the box which shows " System - Regular Labs - Cache Cleaner " as highlighted below. This shall enable the plugin immediately. 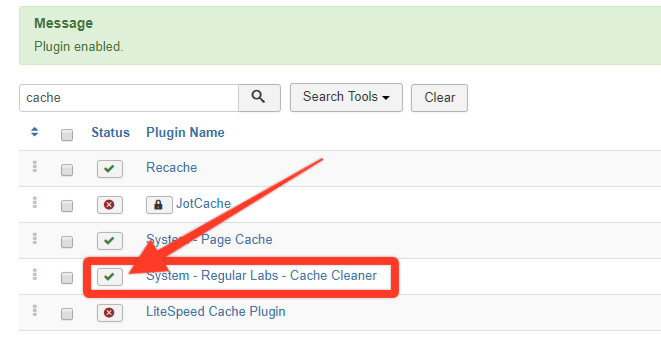 Click on the name of the plugin again " System - Regular Labs - Cache Cleaner " once more.